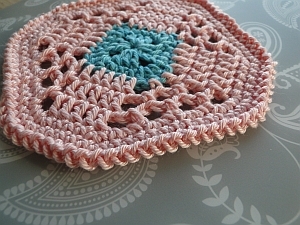 Crocheted in sports-weight yarn with a 3.00 mm hook. Measures just over 3½"/9 cm across. 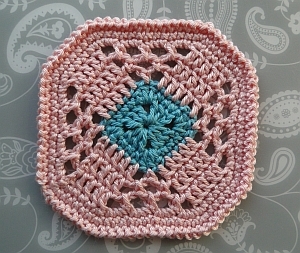 Now, if you want to use just one color, the coaster looks very good like that, too! 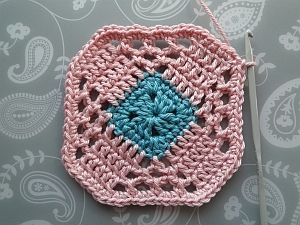 I've also crocheted this piece in Patons 100% Cotton DK, and that one measured 4½”/11 cm across. Round 1: In color A, ch 4 (counts as stitch); 2 dc into 4th chain from hook. (Ch 2, 3 dc into same chain) 3 times. Ch 2, join with a ss into top of 4 ch. Round 2: ch 1, sc into each of first 3 stitches. 3 dc into ch-2 space. (Sc into each of next 3 dc; 3 dc into 2-ch space) 3 times. ss into first sc to join. Weaving in the end for Round 2. 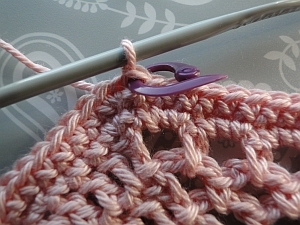 Joining into the 3rd stitch of the corner. 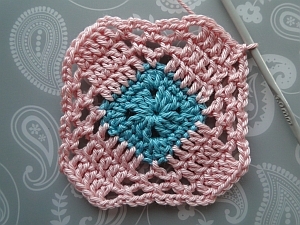 ch 3 (counts as stitch throughout the pattern); dc into each of next 4 stitches. 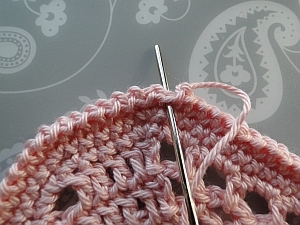 Ch 3, sc into next stitch - which is the center stitch of your 3 corner stitches. (Ch 3, dc into each of next 5 stitches; ch 3, sc into next stitch) 3 times. Ch 3; join with a ss into top of 3 ch. Round 4: ch 3, dc into each of next 4 stitches. *(ch 3, sc into next 3-ch space) 2 times. Repeat from * to * 2 times. (Ch 3, sc into next 3-ch space) 2 times. Ch 3, ss into top of the 3 ch to join. Round 5: ch 3, dc into each of next 4 stitches. *(ch 3, sc into next 3-ch space) 3 times. (Ch 3, sc into next 3-ch space) 3 times. The end of Round 5. Round 6: ch 1, 2 sc into same chain where you joined. 1 sc into each of next three stitches. The first of these is quite tight, so make sure you spot it! 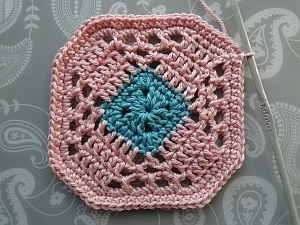 2 sc into next stitch. *3 sc into each of next four 3-ch spaces. 3 sc into each of next four 3-ch spaces. Join with a ss into 1st sc. The end of Round 6. Round 7: ch 1, 2 sc into same stitch where you joined. 1 sc into each of next five stitches. 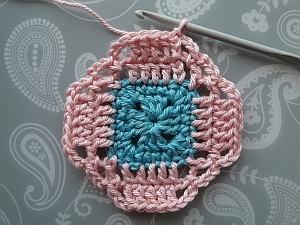 * 1 sc into each of next twelve stitches. 1 sc into each of next twelve stitches. The end of Round 7. 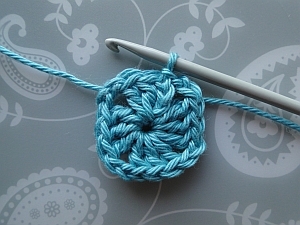 Round 8 - Edging: Two tips before we start this round which is made up of single chains and slip stitches. 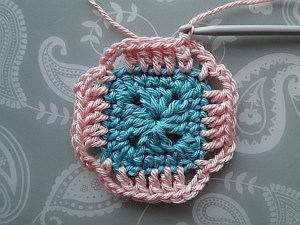 Stitch marker in your joining ss. 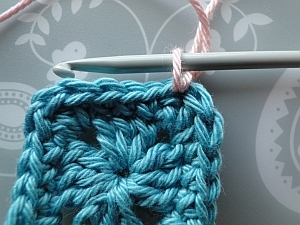 Aim for a neat edging! 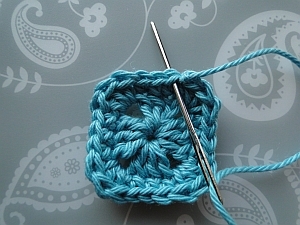 Ch 1, skip the first stitch where you joined, ss next stitch. Weaving in the last tail end. Tie off; weave this end from front to back under top two loops of the same stitch you joined into, before weaving into the back.